Gold and silver have eked out slight gains this week as stock markets came under pressure due to concerns about tech and oil sector valuations, Italian banks and political and financial turmoil due to Brexit. Gold is 0.65% higher for the week in dollars and has seen greater gains in euro (+0.8%) and the pound (+2.17%). The latter has fallen due to political turmoil in the UK and Brexit concerns. The pound tumbled after UK Brexit Secretary Dominic Raab resigned. He was the highest-profile of several departures yesterday. Brexit backer Jacob Rees-Mogg and Prime Minster contender later joined calls for a vote of no confidence in PM Theresa May. The turmoil throws into doubt her ability to secure the UK Parliament’s support for her exit plan – and even to survive as leader. Bookies have made the left wing Labour leader Jeremy Corbyn the favourite to take over from Mrs May – who they give 4/5 to be out before the end of 2018. This will further pressure the pound and should see gold reach new record highs in sterling terms in the months ahead. Stocks in the U.S., Europe and Asia are lower for the week with U.S. stocks being particularly weak. The S&P, DJIA and Nasdaq are down 2.1%, 3% and 2.8% respectively. Oil prices have bounced a bit higher but have collapsed nearly 12% (WTI) so far in November which suggests there may be concerns about oil demand and economic growth in the coming months. It was an important week for GoldCore as we launched the first institutional-grade gold vault in Ireland. Irish, UK and international investors can for the first time store gold bullion bars and coins in professionally managed, secure, institutional grade vaults in Dublin. 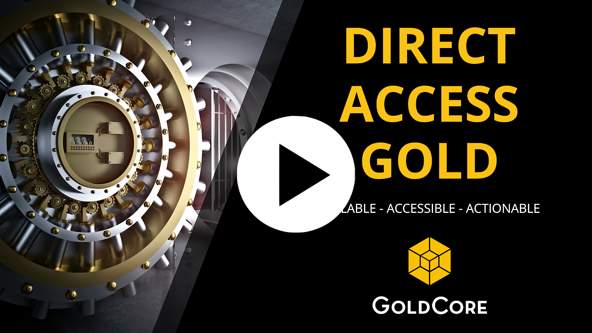 The announcement was widely picked up with Reuters, Irish Times, CNBC, Bloomberg (terminal) and others covering it and we covered it in our subsequently released Goldnomics video update. Gold brokerage GoldCore has opened an institutional-grade vault near Dublin as clients are expected to move their holdings from London to other jurisdictions as Brexit concerns mount, it said in a statement. Storage is managed in collaboration with Loomis International. Since the vault’s soft launch on Oct. 15, ~30% of demand has come from GoldCore’s customers moving metal from London, CEO Stephen Flood said. “We expect the amount of gold stored by our clients in Dublin to exceed that of London sometime in 2019, as U.K. and Irish clients seek to spread their holdings across jurisdictions,” Flood said. o Storage in Dublin has already surpassed Singapore and Hong Kong, and may usurp London as the No. 2 location, behind Zurich. All in all another interesting week in the precious metal and wider markets as gold and silver slowly reassert themselves as hedging assets. They are protecting investors with exposure to stocks and indeed to currencies as was seen in gold’s gains in British pounds this week. It represents an opportune time to rebalance portfolios and diversify out of overvalued assets and into undervalued safe haven gold. The post Gold Rises As Stocks Fall On Valuation Concerns, Italy and Brexit Risks appeared first on GoldCore Gold Bullion Dealer.